Anyone, who can climb down the ladder into the boat, can row. 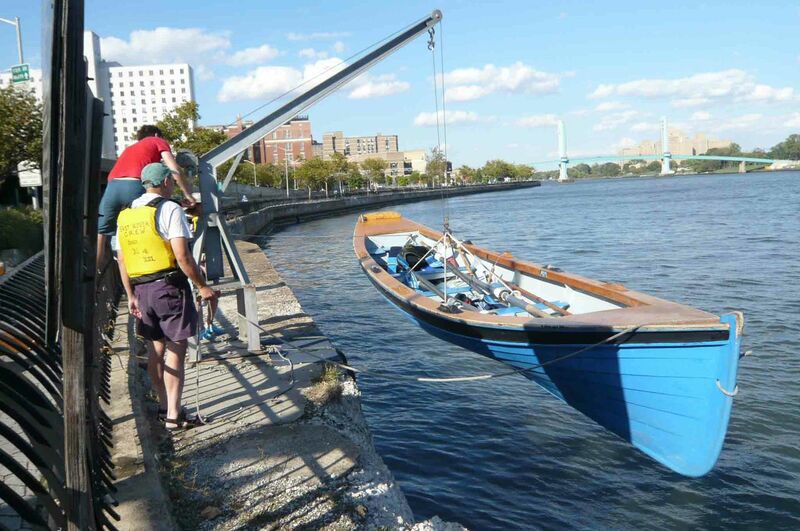 We offer regular weekly rowing sessions, weather permitting, May through October to teach everyone how to pull an oar. You don’t even need to know how to swim! Everyone wears a personal flotation device (or PFD). You do need parental permission if you are under 18 years old. Rowers are expected to take part in shore side activities on the Esplanade or at the Container/Boathouse, either preparing or putting the boats away, before or after rowing. STERN – End of the boat farthest from the direction of travel. Also can be used in conjunction with either four or pair. Stern-four refers to seats eight through five. Stern-pair refers to seats eight and seven. FOOT STRETCHER – Part of the boat against which the rower pushes his legs while pulling the oar. RUDDER – This wooden apparatus is attached to the transom of the boat and partially is submerged into the water. It allows the coxswain to steer the boat. “PREPARE TO MAKE WEIGH TOGETHER” then “ALL, ROW” – Coxswain call to begin rowing. “WAY-OFF!” – Coxswain call to have all rowers stop rowing. Call can sound like “way-nuff”. “HOLD WATER!” – Coxswain call that makes all the rowers drag their oar blades through the water perpendicularly, effectively stopping the boat.. Another way of saying it is “CHECK IT DOWN”. “POWER 10” (or 20 or 30 etc.) – Coxswain call to take a certain number of power strokes. A power stroke is a stroke that musters all the strength you can give. CRAB – A stroke that goes bad. The oar blade slices into the water at an angle and gets caught under the surface, which pushes the rower off-balance. When this happens, push down on the oar.